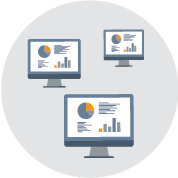 What Are the Right Criteria for Choosing BI Software? Any buyer of BI technology should have a clear idea of what is needed in their project. We recommend that buyers create a list of criteria as the basis of a software selection process. The list should help to give everyone involved in selecting the product a clear understanding of what the solution should accomplish and what functionality is needed in order to achieve this. 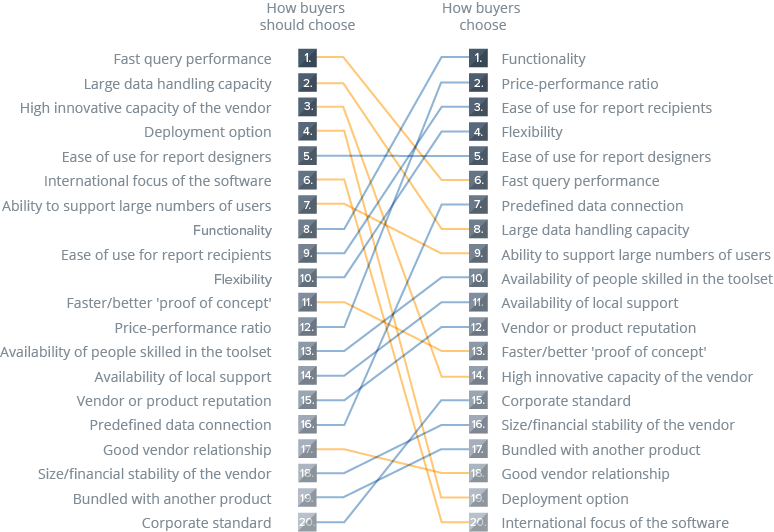 The following article aims to support buyers with information on the buying criteria considered by respondents to The BI Survey, and which of them proved to be the most important and successful. 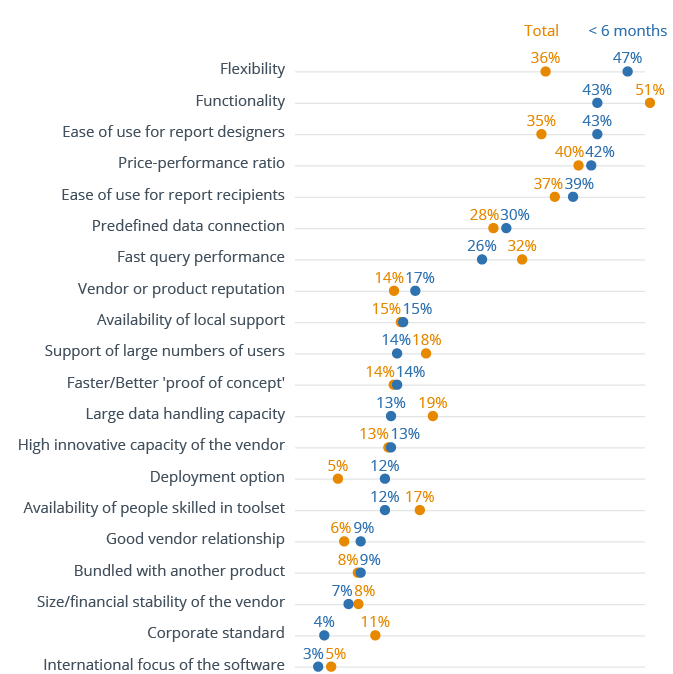 We asked BI Survey respondents to specify the top five criteria they used to select their BI software. Respondents could pick up to five reasons. However, some people chose less. The average was 4.1 reasons per user. Choice was limited to five answers per respondent in order to discover the most important reasons for buying (rather than allowing respondents to select most of the available options). The results are presented in the following figure. 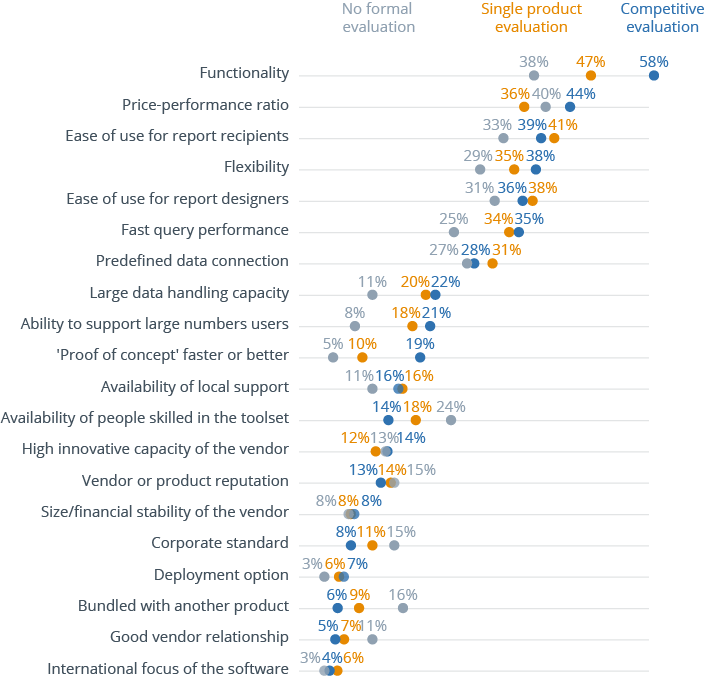 The top ten product selection criteria cited by our sample remain almost the same as last year with ‘functionality’ (51 percent), ‘price-performance ratio’ (40 percent), ‘ease of use for report recipients’ (37 percent), ‘flexibility of the software’ (36 percent) and ‘ease of use for report designers’ (35 percent) occupying the top five positions. 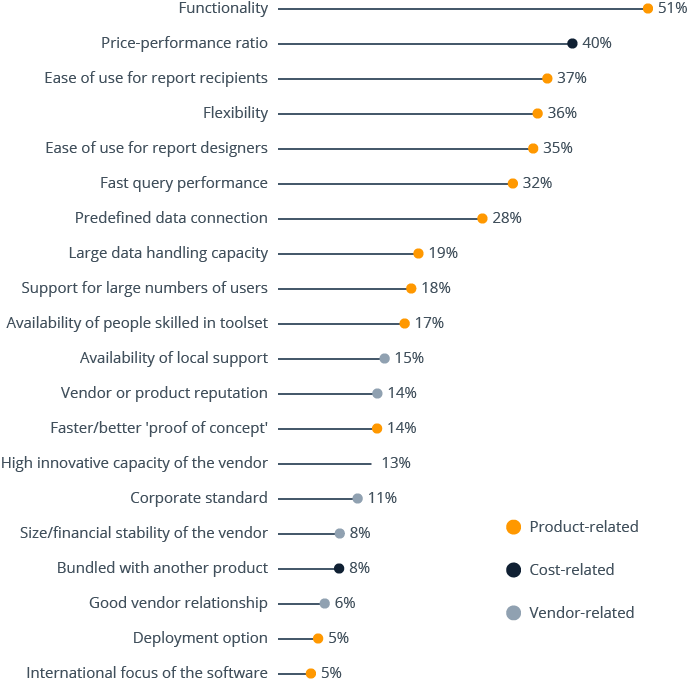 Nine of the top ten were purely product-related criteria, as opposed to vendor or cost-related considerations. Ease of use and flexibility have become increasingly important as they deliver the agility users need in today’s fast changing business environment. Despite the recent prominence of big data analytics in vendor and media announcements, ‘large data handling capacity’ (19 percent) remains a significant but relatively unimportant selection criterion. When comparing selection criteria applied by the total sample against those cited by users who selected software in the last 6 months (see the following figure), the importance of most criteria remains fairly constant with the exception of ‘flexibility, which rises from 36 percent to 47 percent, ‘functionality’, which declines from 51 percent to 43 percent, and ‘ease of use for report designers’, which rises from 35 percent to 43 percent. How does the evaluation method affect the purchase reason? Every project takes different criteria into consideration. Purchase reasons for products differ depending on which evaluation method has been used (see the figure below). Products selected without formal evaluation are chosen more often because they come bundled with another product; because of a vendor relationship or because the vendor is listed as the corporate standard. Conversely, enterprises undertaking formal product evaluations are more likely to select a tool for product-related reasons such as functionality or flexibility. The BI Survey allows us to analyze trends over the past fifteen years. The figure below shows how four very common product selection criteria have developed over time. ‘Fast performance’ saw a net increase in importance between 2010 and 2013, but in each of the last four years we have observed small declines. 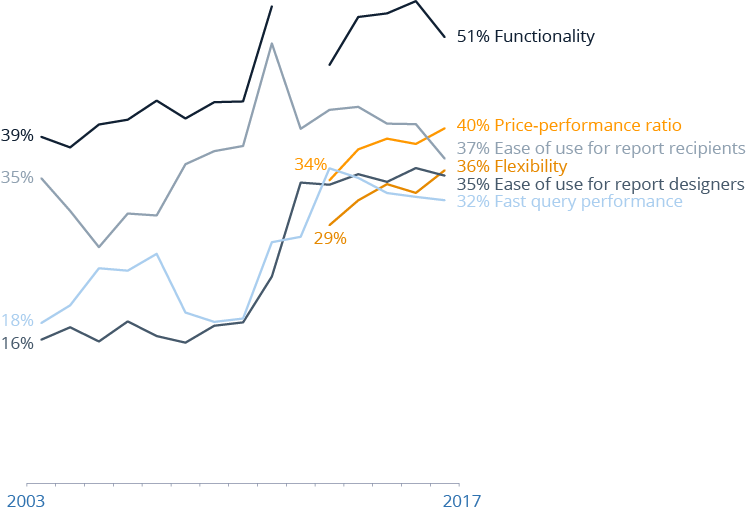 At the same time, ‘price-performance ratio’ has become more significant. 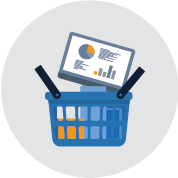 The BI market is a relatively mature one and differences in functionality, performance and usability between the various BI solutions are now less marked than they were a few years ago. Also, the principal market players now have plenty of experience in delivering professional, impressive proofs of concept. As a consequence of these factors, we see price taking on extra significance as a differentiator. 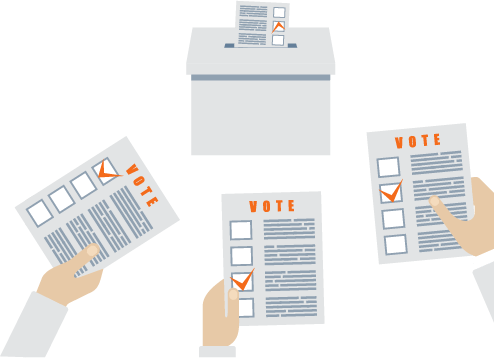 ‘Ease of use for end users’ and ‘ease of use for report designers’ remain popular selection criteria. The increasing demand for ease of use has coincided with the rising trend for ‘self-service BI’ over recent years, with its focus on enabling business and IT users to flexibly adjust applications without requiring the help of specially trained individuals. Self-service is a common requirement for BI projects as organizations attempt to increase agility by empowering users and lessening the burden on IT departments. The figure above shows the trends in frequency of some of the less popular BI software selection criteria over the last fifteen years. 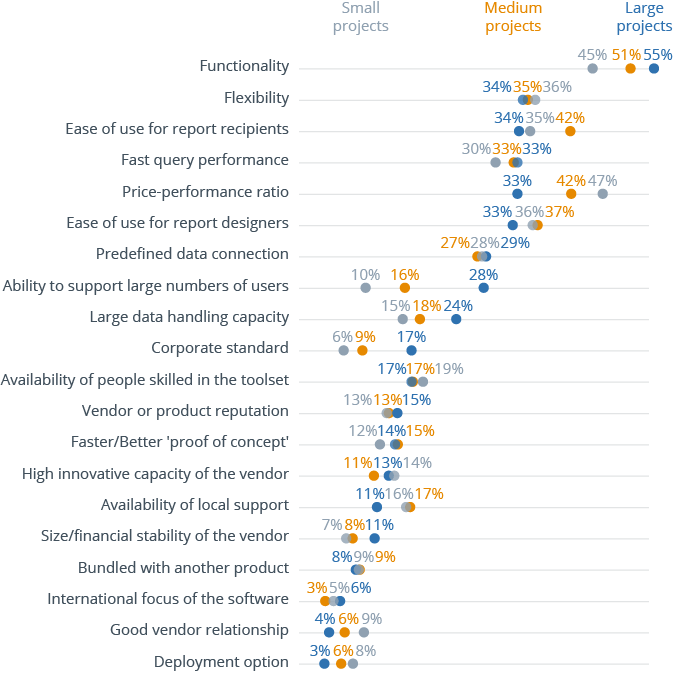 It reveals that organizations are now more likely to choose tools for practical, product-led reasons such as ‘large data handling capacity’ or ‘ability to support large number of users’ than previously. 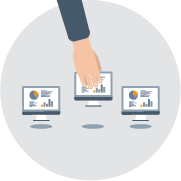 Over the same time period, customers have become less inclined to select a BI tool because of their existing relationship with a vendor. Both ‘vendor relationship’ and ‘bundled with another product’ are less important criteria than they were ten years ago. Interesting similarities and differences materialize when analyzing purchase reasons in different regions. Some reasons, such as ‘good vendor relationship’, ‘international focus of the software’ and ‘size/financial stability’ seldom make the top five list of selection criteria anywhere. In DACH (Germany, Austria and Switzerland), BeNeLux and Southern Europe, respondents show a slightly higher preference for innovation-related criteria (‘innovative capacity of the vendor’). While the top five criteria tend to be similar across all countries, France is noteworthy for reporting that ‘vendor listed as a corporate standard’ is a much more important purchase reason than in other countries. Availability of predefined data connections is an important criterion in German-speaking countries (DACH), possibly due to the dominance of SAP ERP systems in this region. It is not considered so relevant by respondents from Eastern Europe. In German-speaking countries (DACH), ease of use for report recipients is a very important buying criteria while ease of use for report designers is considered far less so. However, the reverse is true in Southern Europe and Asia Pacific. 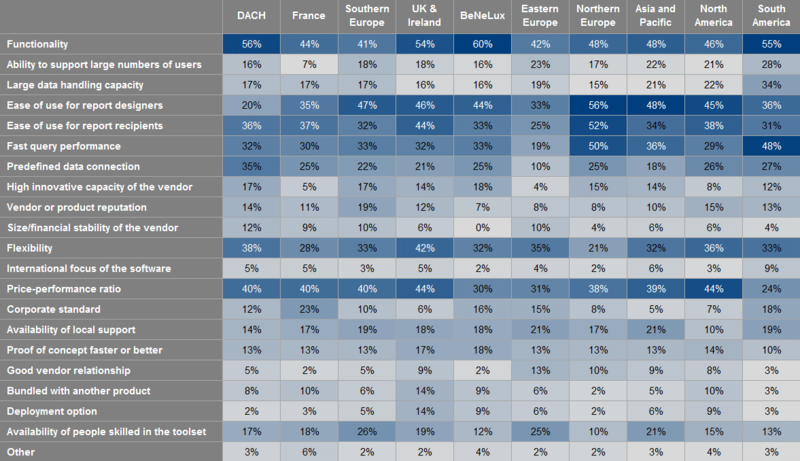 Ease of use for report designers and ease of use for report recipients are key selection criteria all over the world, but especially in Northern Europe and the UK and Ireland. Price-performance ratio is much less significant for companies in South America, BeNeLux and Eastern Europe. In general, most of the selection criteria are of similar importance in all three groups. The importance of price-performance ratio decreases as project size increases. Tools used in large deployments are more likely to be selected because companies have them as a corporate standard, for their ability to support large numbers of users or their large data handling capacity. 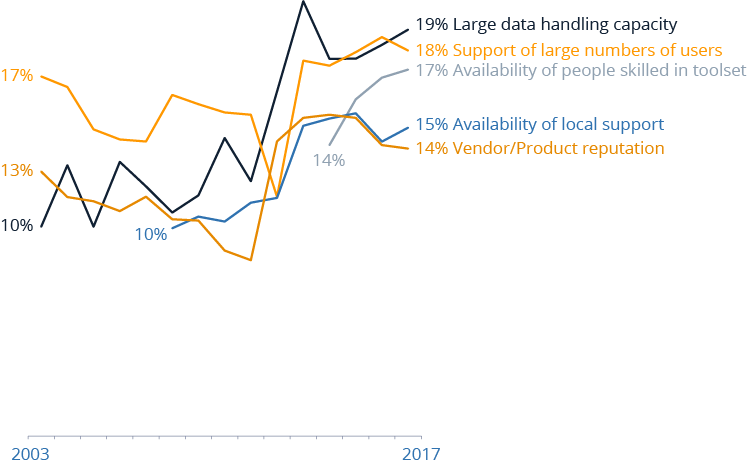 Surprisingly, vendors providing products for large-scale deployments are selected less often for the availability of local support even though they have the biggest, most widespread support organizations. Which purchase reasons lead to greatest business benefits? 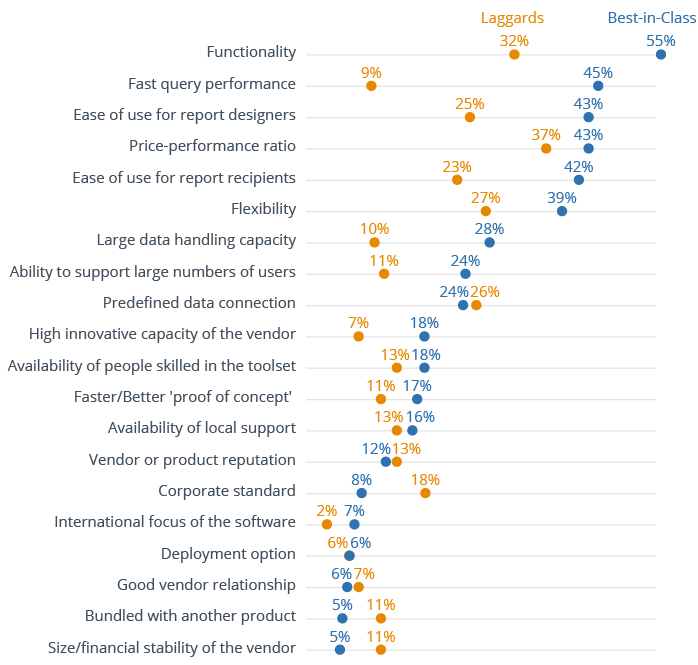 The figure bellow shows the product selection criteria used by best-in-class companies, which confirm that the most successful projects are based on selecting the product rather than the vendor. This is one of the most consistent findings over The BI Survey’s seventeen-year history. Best-in-class companies take more selection criteria into account than laggards (4.6 compared to 3.2). Best-in-class companies are much more interested in functionality, ease of use and fast query performance; all key considerations in enabling self-service BI. Laggards, on the other hand, are more concerned with non product-related criteria such as ‘vendor listed as corporate standard’ or ‘bundled with another product’. The BI Survey uses the Business Benefits Index (BBI) to measure the success of BI projects. The BBI is an innovative way of assessing which product selection criteria are typically associated with successful projects. We contrast ‘how buyers should choose’ and ‘how they actually choose’ in the figure below. The table shows reported rankings on the right and suggested BBI-optimized rankings on the left. Red and green arrows represent the recommended change. For example, ‘deployment option’ has the fourth highest BBI-based ranking, but it ranks nineteenth in the list of criteria actually used, fifteen places lower. Choose the product, not the vendor. Analysis reveals that using product-oriented selection criteria increases project success. Don’t forget to include innovative features on your key criteria list as they are often linked to improved business benefits. 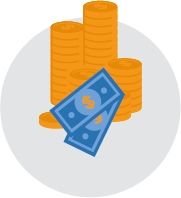 Don’t use cost as a key criterion for selecting BI software.